The bumpy downward action of gold prices since the first of the year has led to increased skepticism, at least in the West, about about the metal's future. Last week the Wall Street Journal ran an article titled “Gold Fades From Investment Picture.” It cited a sale of 12,000 ounces of gold by the Russian central bank. That may sound like a lot, but let's put it in perspective. 12,000 ounces is less than one-half (0.37) of a metric tonne—but Russia has been regularly buying about 100 tonnes every year. In the last 4 and 1/2 years, it bought 477 tonnes of the metal. So the sale of less than a half tonne is certainly not disturbing. That sale followed 11 consecutive months of Russian purchases, totaling 12.722 tonnes in 2013, including 6.3 tonnes in July alone. Central banks are still buying gold, but perhaps less of it. Through August of this year, they added 6.2 million ounces, compared to 9.6 million ounces for the same period in 2012. Significantly, the report that central banks are buying less gold does not include China's central bank. The central banks of Canada, Denmark and Mexico were among the few who sold small amounts of gold so far in 2013, but at least 15 central banks bought gold, including Turkey's, which bought 82 tonnes. China has not disclosed its central bank gold purchases since 2009, but it is known to have been buying from, among other sources, mines within the country. These include mines owned by the Chinese as well as those owned by foreign companies who must sell to the government at market prices. China is the top gold producing nation in the world. It is also the top consuming nation as the public as well as the central bank are avid buyers. The government encourages people to buy gold as part of its goal to “store wealth among the people” and makes it easy for them to do so. They can buy it at any bank or at gold stores throughout the country. These look like jewelry stores, but they exist to sell gold. The government even runs TV ads encouraging people to buy gold. Vast amounts of gold enter China, mainly from Hong Kong, which is a Special Administrative Region that operates under different rules from the rest of China, and is the most significant supplier of the coins and bars the public buys. This chart illustrates four important things: (1) the steady upward trend in Shanghai gold deliveries throughout the period and the surge in 2013, (2) Shanghai's decline in the last month is tiny compared not only to the previous month but to many larger declines throughout the chart which did not reverse the long uptrend, (3) the short vertical black lines accompanying each red line on the chart show that gold deliveries on New York's Comex are very minor compared to Shanghai's and, moreover, that Comex's decline last month was several-fold larger than occurred on the Shanghai exchange, and (4) that Shanghai's physical delivery is almost equal to the gold production of the entire world. 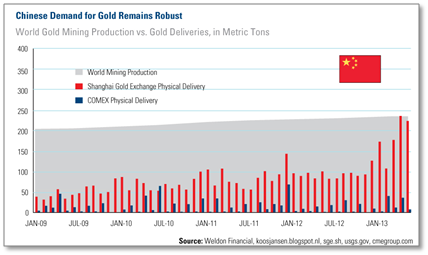 This year the SGE is on track to deliver 2125 tons of gold this year, 87 % more than in 2012. Western media and other information sources concentrate on what is happening in U.S. markets and seldom enlighten Americans about what is happening in Shanghai, Hong Kong and other Asian markets, which in this case tell a vastly different story. After the $200 drop in the gold price in April, Americans were told of the drop in the gold price and mass selling of gold ETFs and gold mining shares in the U.S., but few were made aware of the upsurge in physical gold buying in Asia. For example, “buyers outnumbered sellers by a huge margin.” according to Reuters. “At Ginza Tanaka, the headquarters shop of Tanaka Holdings, gold buyers waited for as long as three hours for a chance to complete a transaction.” Bullion traders reported trading volumes doubled and the buy/sell ratio was 95 to 1. Premiums for physical delivery in Shanghai jumped to an unheard of $34.82 per ounce. Japanese individual investors doubled gold purchases on April 17 at Tokuriki Honten, the country’s second-largest retailer of the precious metal. In Australia, “the volume of business… is way in excess of double what we did last week,… there’s been people running through the gate,” said Nigel Moffatt, treasurer of Australia’s Perth Mint. In Bangkok, Thailand, crowds filled the stores and eagerly waited in multiple lines to buy gold jewelry and coins. Merchants in Macau and Hong Kong reported 150 percent increase in sales in late April. 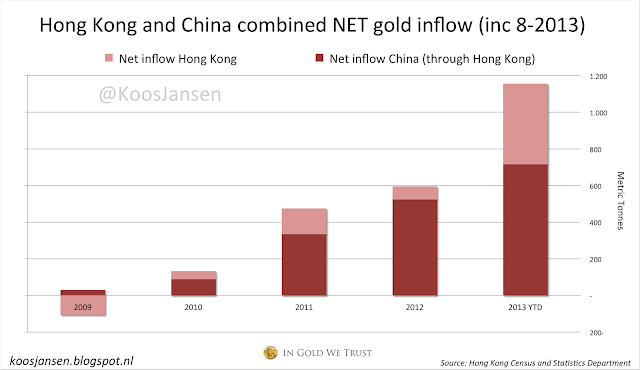 Chinese gold imports from Hong Kong more than tripled since 2012, from 62.5 metric tonnes to 223.5 tonnes. On April 26, the Chinese Gold & Silver Society in Hong Kong reported it had sold out all its inventory and placed orders in Switzerland four times larger than normal in response to demand. According to Economic Times, India imported 142.5 tonnes in April and 162 tonnes in May, compared with an average monthly rate of 86 tonnes in the first quarter 2013. This year an unprecedented amount of gold has been distributed in a historic transfer of wealth from the West to the East. It came mostly from the United Kingdom. As of October 10, 2013, 1137 tonnes of gold were exported so far this year from the UK with 1002 tonnes going to Switzerland, 101 tonnes to Hong Kong and 89 to Dubai. These exports came mostly from ETF sales of gold stored in the UK and from the London Bullion Market Association. Four of the largest gold refineries in the world are in Switzerland. They have been recasting some of the 400-oz gold bars into smaller, more convenient sizes and exporting them to Hong Kong, which serves as an outlet not only to China but to Taiwan, Thailand and other Asian countries. 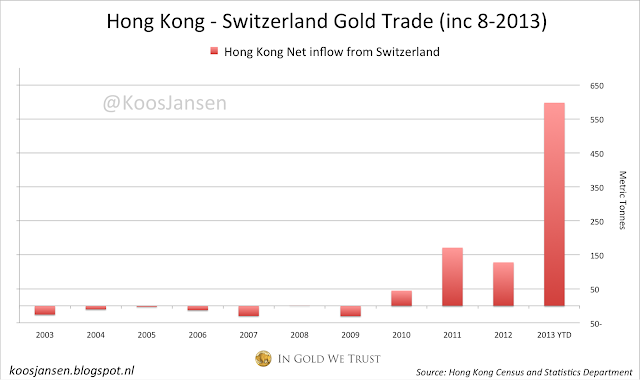 Data from the Hong Kong Census and Statistics Department show the phenomenal increase in Hong Kong-Switzerland gold commerce, which is a conduit for the massive transfer of wealth to the East. Later a few German representatives were allowed only into an anteroom, not an actual storage area, below the New York Federal Reserve Bank, where the gold was said to be stored. They were shown 5 or 6 gold bars and told these were “representative for Germany's holdings.” But if gold bars are not numbered and allocated, they can be shown to any number of banks as “their” gold. Apparently there later was a second visit, when the Germans were allows to “look into” one of nine storage rooms but were not allowed to enter the room or touch the gold. Three months later, in January 2013, it was announced that the U.S. and Germany agreed the U.S. would return 300 tonnes of gold to Germany in a series of shipments that would take until 2020 to complete. The U.S. would continue to store the remaining 1,200 tonnes of Germany's gold. All this certainly gives the appearance the New York Fed did not actually have the gold. If the bank had it, why not give it to Germany? Why would it return only 300 tonnes? And why would that take 7 years to accomplish this? People who know more about transporting such cargo than I do say it could be done in a week if necessary; certainly several weeks or even months would be more than adequate—but 7 years? Germany had previously repatriated 940 tons of its gold from the Bank of England without undue delay. If the New York bank did not have the gold, it would have to buy it to repay Germany, and a large purchase would push up the price, which the bank certainly did not want. The needed gold would have to be bought in small amounts over an extended time. Alternatively, and more likely, the bank may have the gold, but it may have been leased, hypothecated or encumbered in some manner so that it could not be transferred to Germany. These possibilities, too, would require additional time to unwind. Now let's examine the big drop in the gold price in April. It began on April 12 when 400 tons of gold were offered for sale immediately on the opening of the market. Such a large sale on the opening was obviously an intent to panic the market, which happened. If an investor had a large amount of gold to sell, you would expect he'd want the best possible price. Instead of selling the full amount immediately, he would have split it into several smaller orders fed in throughout the trading day, or perhaps several days, in order to minimize the downward impact on the price. Also, many traders take their clues from what happens on the open before they place their own orders. The huge sale of 400 tons on the open immediately set a downward tone for the market. And as prices plummeted, stop-loss orders were hit, adding more selling pressure and further depressing prices. The sale of 400 tons was so large it almost certainly came from a central bank. The Fed was an obvious choice. Of course, the Fed would not place such an order itself; it would be done through one of the Fed's bullion banks (those “too big to fail”) such as Goldman Sachs or J.P. Morgan. A large drop in the gold price would present an opportunity to acquire gold at bargain prices and help the Fed out of the bind it had created for itself in the shortages in German and other central bank accounts. Of course, it would also create a profit opportunity for the bullion banks themselves. Most Americans find it incredulous that the Fed would be involved in manipulations that left it unable to honor its custodial agreement with Germany. But the European Central Bank website states, regarding statistical treatment of Eurosystem's International Reserves: “reversible transactions in gold do not have any effect on the level of monetary gold regardless of the type of transaction (i.e. gold swaps, repos, deposits or loans), in line with the recommendations contained in the IMF guidelines.”6 (Emphasis theirs). Thus central banks are permitted to carry physical gold on their balance sheet even if they've swapped it or lent it out entirely. It is also significant that back in 1999 a study by the International Monetary Fund found that central banks of 80 nations were lending out their gold reserves. The loans amounted to 15 percent of their gold. The central banks were operating as fractional reserve banks. In May 2013 a research assistant for Stansberry & Associates visited the Federal Reserve's gold vault in downtown Manhattan. He was surprised how tiny it was, only about the size of a locker room at his high school. From his estimated size of the vault, he calculated it could hold 615,000 bars of gold. He was told there were 533,000 bars there—but the vault was no more than half full, at best. He calculated a discrepancy of 106 million ounces, equal to $169 billion. In 1998 Fed chairman Alan Greenspan testified at a House Banking Committee, “Central banks stand ready to lease gold in increasing quantities, should the price of gold rise.” In other words, if gold prices go up, the Fed would make sure they come back down. Why? Apparently because of fear a rising gold price would weaken the dollar's exchange rate and the Fed's control of interest rates, but it would also discourage people from buying gold as an investment. In 2013, gold prices were much higher than in 1998, giving the Fed a stronger reason for knocking down the gold price. Solid gold serves as a basis for the “paper gold” of futures contracts and creates a multiplier effect in the process. Here's how it works. Big bullion banks borrow gold from central banks and then bring the leased gold to market. They sell the same gold to multiple parties and use the cash to buy something (e.g. bonds) and use a portion of the proceeds to hedge their future exposure through futures contracts. Leased gold must eventually be returned to the central banks because the leases have time limits. The time limit is the window of opportunity for the buyer of the lease, but it is also a window of risk that the gold price may rise and eventually force the bullion bank to buy at a loss in order to be able to return the leased gold to the central bank. The solution is to go into the futures market and buy for delivery of gold at a specific suitable price on a specific date in the future. Then the bullion bank is assured of a future profit and doesn't care whether the price goes up or down in the meantime. New York's Comex is the leader in gold futures contracts, accounting for 82 percent of the world trade in them. But the overwhelming majority of these do not involve any physical exchange of the metal; they are simply paper trades—or now, digital ones—because most positions are closed out before the delivery date. A buyer will almost always sell his contract before delivery is due, and a short seller will do just the opposite. Neither trader will see the gold, and the Comex will have exactly the same amount of gold in storage as before those traders participated. Physical delivery is a very small part of Comex business. The Comex warehouses gold to back its contracts and offer a delivery option, though some concerns have been raised about its adequacy of the metal in the event of a large increase in delivery requests. The volume of physical deliveries from the London Bullion Market is nine times larger than that of the Comex. The LBM is the center for a very large majority of the leasing operations I have just described. Many members of the Comex exchange are also members of the LBM. Decades of excessive U.S. government spending—which has accelerated under President Obama—has created doubts about the future of the dollar. In his first term of office, he added as much to the national debt as all the presidents from George Washington through George W. Bush combined. In the fifteen months following collapse of the housing/mortgage bubble in 2008, the Fed created more money than in all the years combined since 1913 when it was founded. Because the dollar is the reserve currency of the world's monetary system and 85 percent of foreign exchange transactions are denominated in dollars, distrust has grown worldwide about not only the dollar but the international monetary system itself. The uncertainty about how all this will end—which must happen—has led people to turn increasingly to possession of physical gold. ETFs, gold mining stocks, mutual funds, and commercial custodial accounts of gold all depend on a counterparty, which may fail in a time of turmoil. (1) the federal debt, now at $17 trillion, is greater than everything being produced in the country. The gross national product (GDP) of the U.S. was $15.89 trillion in 2012 ($15.97 trillion in Q3 estimate for 2013). (2) The $17 trillion debt does not include future costs of Social Security, Medicare and Medicaid, which run $55 trillion, bringing the total to $72 trillion. Government Medicare and Medicaid costs, even without ObamaCare, will rise 5 times faster than Social Security costs in the future. Even more with ObamaCare. (3) Total net household wealth in the U.S. (including real estate, durable goods, deposits, pensions, mutual funds, corporate equities and “other”) is $74.82 trillion. Thus what the U.S. government owes roughly equals everything in the country owned by everyone. (4)The GDP of the entire world is estimated at $72 trillion. Thus the U.S. with 4 and 1/2 percent of the world's population owes roughly what the entire world (including the U.S.) produces. (5) Several economists project far greater future federal government costs. For example, Laurence Kotlikoff, a Professor of Economics at Boston University, a Fellow at the American Academy of Arts and Sciences, a Fellow of the Econometric Society, and a member of President Reagan's Council of Economic Advisers, puts the cost of the federal government's unfunded obligations at $202 trillion, almost 3 times the GDP of the entire world. The economy in the U.S. added an average of only 143,000 jobs monthly in the third quarter of 2013, not enough to equal population growth. That's down from 182,000 in the second quarter and 207,000 in the first quarter. Unemployment remains stubbornly above 7 percent. The labor force participation rate, which is the number employed plus those looking for work, has fallen since Obama became president in January 2009. The rate then was 65.7%. By the end of Sept. 2013, it had fallen to 63.2%, as the number of Americans not participating in the labor force increased by more than 11 million people. Massive government spending and interventionism by the administration has failed to stimulate economic growth. That requires free markets and sound money. The situation in Europe is also discouraging. Despite bailouts of Greece and several other countries and massive loans totaling a trillion euros by the European Central Bank to 521(!) banks in December 2011 and to 800(!) banks in February 2012, the promised results have not occurred. The European Union on November 5, 2013, downgraded its expectations for euro-zone growth next year and said the unemployment rate will probably stay near record high levels through 2015. France received two extra years to bring its deficit under 3% of GDP as required by EU rules. Spain is forecast to miss its budget target by a wide margin. The latest government plan, negotiated with the EU, called for a deficit cut to 4.1% of GDP, but the European Commission now forecasts the Spanish deficit at 6.6% in 2015. And Spain, Portugal and Greece could be left with unemployment rates above 15% for years. The international inspectors say Greece must take further measures to cover a projected failure to meet its target for next year and will require additional aid in mid-2014, when the current aid package expires. But Greece has refused any further across-the-board budget cuts or tax increases. So what will happen? The grand worldwide experiment with fiat money has failed. It will come to an end. The world has never experienced such a lengthy period as we have now seen without a money backed by precious metal. That will change. If the U.S. and the rest of the Western world do not return to gold-backed money, some other country will. Think China. A gold-backed Chinese currency would attract wide support in Asia and perhaps from countries like Russia and Germany. One way or another, the world will return to gold because it is necessary for a sound monetary system, which, in turn, is necessary for economic growth and the exercise of individual rights. That is what freedom means and what it requires. “Gold is money. Everything else is credit.”--John Pierpont Morgan.